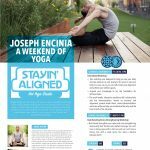 Original 26 & 2 “Master” Class | 1.5 hours | Includes yoga demonstrations and a 120 minute – 26 & 2 series practiced in a room heated to 105°F. 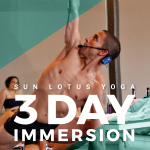 Lotus Series Workshop | 1 hour | An understanding and appreciation of the preparation, technique, and execution of the postures including specific poses that allow you to develop the needed skills in order to fulfill this series. Original 26 & 2 “Master” Class | 2 hr | Floor series focus and an in-depth understanding and technique of the floor series poses. Backward Bending Series Workshop | 2 hr | An understanding and appreciation of the preparation, technique, and execution of the postures, allowing you to find the balanced between strength and flexibility of your spine. Original 26 & 2 “Master” Class| 2 hr | Standing series focus on a functional use of the core strength and an in-depth understanding and technique of the standing series poses. Arm Balancing Series Workshop | 2 hr | An understanding and appreciation of the preparation, technique, and execution of arm balancing postures and exercises that will allow you to create the skills necessary to develop the strength and control needed.